Relying on a well-vetted set of methods, the study evaluates the health and environmental benefits associated with reductions in sulfur dioxide (SO2), nitrogen oxides (NOx), fine particulate matter (PM2.5), and carbon dioxide (CO2) emissions. The study explores the impacts of wind and solar power generation from 2007 to 2015. Wind and solar power provide air quality and climate benefits by reducing the need to generate electricity through other means. This study uses a statistical model to determine which power generators would have most likely been turned on, or turned up, to meet electricity demand had wind and solar power not been available. The emissions characteristics of these generators can then be used to determine the likely quantity and location of avoided power plant emissions. A suite of air quality models was then used to estimate the public health benefits of the avoided emissions. By using multiple air quality models, the article reports a range of impact estimates and demonstrates some of the uncertainty associated with these models. Similarly, a wide range of monetary values is applied to avoided CO2 based on a review of the literature and reflecting the uncertainties associated with climate benefits. Over the course of the study period a number of changes were seen within the power sector. Generation from wind and solar power grew rapidly and fossil fuel price changes and regulatory rules led to a steep reduction in overall electric power sector emissions. Power sector emissions also vary dramatically by region. This study, therefore, examines how the air pollution impacts of wind and solar have changed both over time and across regions. Additionally, the article examines the influence of regional SO2, NOx, and CO2 cap-and-trade programs. Cumulatively, from 2007 through 2015, wind and solar electricity generation reduced 1.0, 0.6, and 0.05 million tons of SO2, NOx, and PM2.5 respectively. These emissions reductions helped to avoid 7,000 premature mortalities based on the central estimate (3,000 to 12,700 over the full range of estimates). The avoided premature mortalities and other public health impacts are valued at $56 billion based on the central estimate ($30 to $113 billion across the full range of estimates). Avoided CO2 emissions are valued at $32 billion based on the central estimate ($5 to $107 billion across the full range of estimates). The figure above shows the combined wind and solar health benefits each year over the study period. In 2015, the central national average combined air quality and climate benefits equal 7.3 ¢/kWh-of-wind and 4.0 ¢/kWh-of-solar. However, a wide range in per kWh hour benefits was found across regions, with the highest per kWh benefits in the Midwest, mid-Atlantic, and Southeastern regions. 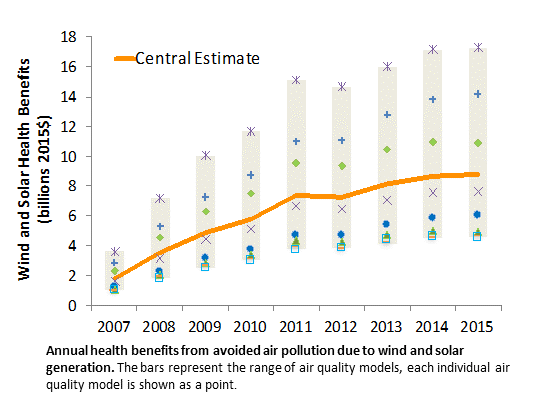 For example, in 2015, combined air quality and climate benefits equaled 14.3 ¢/kwh-of-wind in the Mid-Atlantic region and 2.5 ¢/kwh-of-wind in California. There were only small variations between the per kWh benefits of wind and solar on a regional basis, indicating that, from a value perspective, the differences across regions is much more important than the differences between the time-profiles of wind and solar generation. If you have any questions on the article, feel free to contact Dev Millstein (510-486-4556, [email protected])or Ryan Wiser (510-486-5474, [email protected]) at Lawrence Berkeley National Laboratory. We appreciate the funding support of the U.S. Department of Energy's Office of Energy Efficiency and Renewable Energy.